A recipe for two perfect days in Heraklion…well of course, there are many variations on this tantalizing theme and there’s no better way to start, frankly, than with breakfast at Legacy Gastro Suites. Take the freshest locally-sourced and deliciously Greek ingredients, add the comfort of your luxurious suite, plus the mesmerizing view of the blue Mediterranean and you have perhaps the ideal entrée to Crete’s largest and slightly inscrutable city. Remember, Heraklion is a city of heroes—it’s named after Herakles (Hercules)—and a city of the sea. Indeed, it owes its present layout to that great maritime power, Venice. 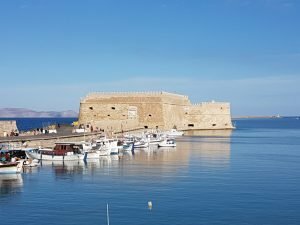 The Venetians ruled Crete for centuries and left their mark everywhere, most formidably in the ramparts which encircle the city center and the Rocca al Mare fortress, now called Koules, that guards Heraklion’s inner harbor. This is where the traditional introduction to Heraklion begins, and there is no better spot to begin the first of two days of experiencing Heraklion’s highlights. You can inspect the fortress itself and enjoy the view of the city from the battlements or simply stroll by the harbor with its colorful fishing boats. Looking south, and right opposite the port, you’ll see a series of might stone arches, the remnants of the Venetian ship sheds that not only berthed vessels but were used as an arsenal for guns and gunpowder. The Republic of Venice invested a lot of time and treasure in defending Heraklion, which finally fell to the Turks in 1669. From the harbor, the tourist’s typical trajectory is up to 25th of August Street, but before you head up that slender inclined thoroughfare stick closer to the waterfront and head to the fabulous Historical Museum of Crete, locating in a sea-facing townhouse on Sofokli Venizelou. 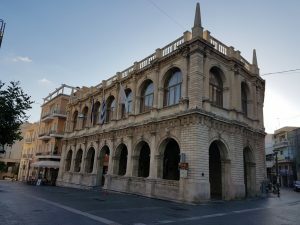 The museum offers a comprehensive view of Cretan history and art from the early Christian centuries to the 20th century and truly has something for everyone. There are evocative early Christian artifacts as well as stonework and decorative objects of Roman, Arab, Byzantine, Venetian and Turkish origin. Beautiful ancient maps to make you dream of a different time. The detailed panoramic wooden model of medieval Heraklion, or Candia as it was called by the Venetians (who adapted that from the prior, Arabic name of El Khandak) has push-button spotlights to highlight locations of sites of worship, defense and government—some of which are still standing. This is a great fun for kids as well as adults. But don’t stop at the first floor, because upstairs there’s an absolutely gripping exhibit on the 10-day Battle of Crete (May 20-29, 1941) that details not only a pivotal event in the European theater of World War II, but also reveals much about the strong Cretan character, and how hard the people of the island will fight for their freedom. Now go further: because there is freedom of the streets and freedom of artistic expression: the museum houses two paintings by El Greco, The Baptism of Christ (1569) and View of Mount Sinai and the Monastery of St. Catherine (1570), as well as the reconstructed library of Crete’s most famous literary lion: Nikos Kazantzakis, author of Zorba the Greek and The Last Temptation of Christ. Now you are ready for 25th of August Street, the Champs-Élysées of Heraklion, only without all the traffic. As you walk past a succession of elegant façades, you will soon see on your left the beautiful and somewhat fanciful St. Titus Cathedral. St. Titus was a travel companion to St. Paul and preached the gospel in Crete during the Roman era. The original church on this spot was built in the second Byzantine period and the present was used as a mosque under the Ottoman Turkish occupation. Go further and more Venice is served, in the form of the beloved 16th-century Loggia building. It’s next to St. Mark’s Basilica, which now houses the Municipal Art Gallery. 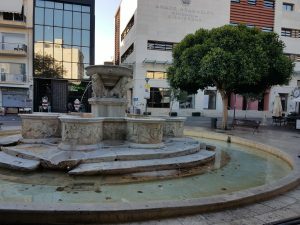 In a moment you are in the heart of Heraklion, the Morosini fountain at Liontaria, or Lion’s Square where everyone in town seems to end up before deciding which café to park themselves in. The four lions of the fountain aren’t large, and you would almost want to tickle their chins were they not made of stone. The eight cisterns also feature depictions of figures from Greek mythology such as nymphs, Tritons, sea monsters and dolphins. The fountain is named for Francesco Morosini, the Venetian governor who had ordered its construction. Have a Greek coffee by the fountain or if it’s summer, a freddo espresso as the locals do, and power up for dinner. Of course, the history of Heraklion and Crete stretches back much more than just a few centuries, and now that you have a handle on medieval and contemporary Heraklion, you’ll be ready for some real time travel on your second day of exploration and that’s what the Heraklion Archaeological Museum—one of the most famous and most important archaeological museums in the world—is all about. After breakfast at the Legacy (à la carte today, perhaps? ), cross Eleftherias Square where you’ll find the museum entrance. The treasures of the Minoans, Europe’s earliest civilization, await your discovery. You will be amazed at the locals created from around 2700BC up to around 1450BC. Palace frescoes from Knossos, flamboyant Minoan jewelry, the exquisite figurine of the bull leaper—which item will captivate your imagination the most? Maybe they all will so be sure to give yourself a couple hours here at least to take it all in. After, walk down Idomeneos Street until you find a small square with cafes such as the 626 at the Olive Green Hotel, a favorite of Herakliotes—the locals—for such items as chocolate pancakes and pancakes with yogurt mousse (there’s a stellar croque monsieur, too!). As you walk to the west, the narrow streets offer up one café, bar, and restaurant after another. Explore this lively and charming area to your heart’s content and wander back to Lion’s Square, but this time, from the Morosini fountain head north to 1866 Central Market Street. This is the place to shop for everything from an extra pair of socks to real Cretan herbs and raki (a potent Cretan spirit). You’ll end up at the Bembo Fountain and Plateia Kornarou, named for the great Cretan poet Vincenzo Kornaros. Head left on Averof Street: in just a few minutes you’ll be back at Eleftherias Square and Legacy Gastro Suites.